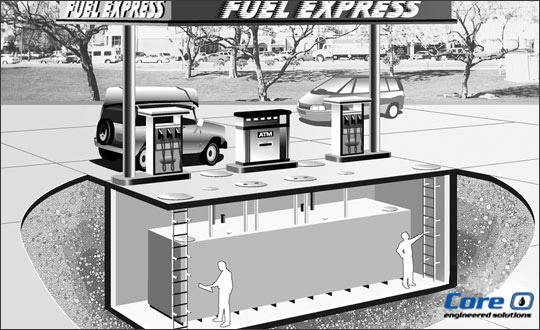 The UL 2245 Listed SafeSite Fuel Vault Storage System provides below grade fortified protection where fuel is safely contained and water is sealed out. The unique seamless sectional vault construction offers uncompromising environmental protection to soil and groundwater. As a result, it resists corrosion, rising water tables or even the sudden trauma of earthquake activity. The vault incorporates a specially formulated concrete mix that is factory-poured in two parts. Because the storage tanks are located within a vault that allows for easy accessibility and visual inspection by your personnel, they are classified by the EPA as Aboveground Storage Tanks (AST).